Our organization Hiren A. Gandhi & Associates is a front runner in the Interior Architecture field. We have the best projects that had been completed with distinction in 34 years of our existence in this field. The various different Industries to which we served in our client list are from finance, banking, educational institutions, government offices, media, energy, steel, space, metro stations, etc. Currently we have completed the project on the interiors of Gujarat State Cooperative Marketing Federation (GUJCOMASOL). The special VIP entrance to GUJCOMASOL is eco friendly. The glass facade door using double blazing unit makes a pleasurable experience for the customers. The use of glass wall and wooden textures upon going to the concerned department is also well maintained. On one side is the modern glass wall for keeping up with current time. On the other side are the wooden textures for taking the past in the future. As we go with eco-friendly concept in every project that we make, natural light in the day time is a good view for both the employees and its customers. This also saves electricity expenses. The waiting room is available with adequate seating arrangements for the visitors. It has unique wooden furniture made of bamboo and cane with nice colored cushions that matches up the room background. The rural art like Pithora has been set up on the desk panel. The meeting room has curtains with subsequent seating arrangements for the senior managers. It has a good V.R.V. system which extends throughout the building with good LED light arrangements, nice seat design, and floor textures. 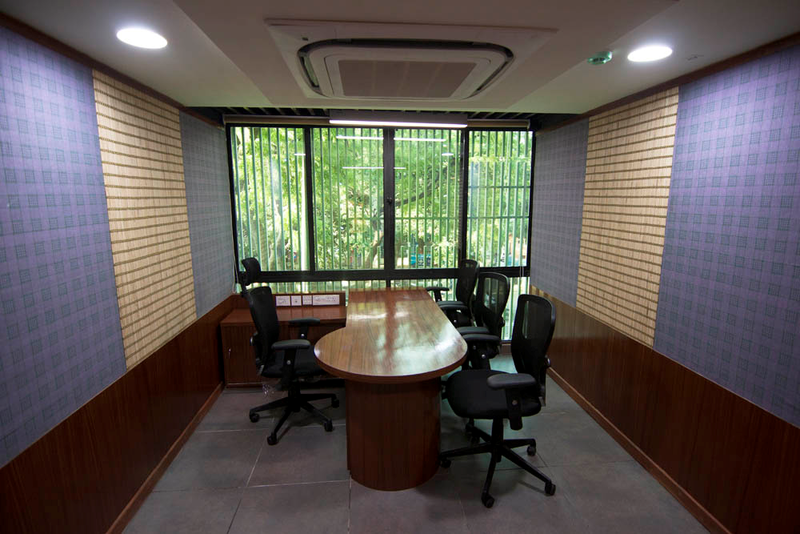 GUJCOMASOL project has a separate small room where an urgent talk can be done with the concerned person by atleast two people at one time. This small room has the mobile and laptop charger point as well. All rooms have good ergonomic seats. The manager’s room has a seating capacity of 5 persons including the manager. Moreover, manager’s seat is totally made of leather for the daily comfort. The manager’s room has good open cabinet facility to showcase the personal achievements which can be kept there. In addition to it, manager’s room has the glass window from where the outside world can be looked with changing backgrounds every time. Manager can also take a short nap in the room comfortably in the seat after a hectic business schedule. The physically challenged persons have the access to the toilet which has been separately made for them. A provision of meeting during evening hours with natural light coming from outside sets the tone for a wonderful relaxing business meeting. The stairways have good walls and rods. When it comes to the employee working conditions, it has nice cubicles with office pins for maintaining up to date work priorities. The cubicle has good light arrangements on Bamboo. Cubicle also has drawer facilities. The roof has the skylight facility which has polycarbonate sheet as a cover up above for receiving more light than heat. A green roof is also made for multipurpose activities like recreation facility when the heat is absorbed through green roof. A large building comes with risk. We are committed to give best safety to our clients. Hence fire fighting provision with a 1 lac litre of water has been created separately in an event of unfortunate event.